As always, let’s start with the polls. Last time I suggested that Leavers might want to start thinking seriously about their lack of a lead in the opinion polls. This time around they appear to have good reason to feel a little more optimistic. 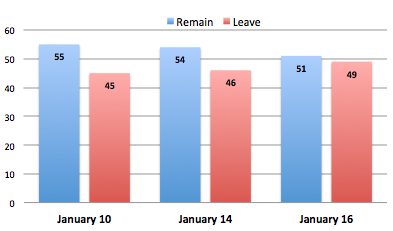 Before Christmas, in the Poll of Polls, Remain was sat fairly comfortably on 55% and Leave on 45%. But in recent days two recent online polls have put Leave ahead, causing the overall race to narrow, as shown below. The Poll of Polls now has Remain on 51% and Leave on 49%. If the race was tight before, it looks even tighter now. What triggered the change? Well, an online poll by Survation put Leave on 42%, Remain 38% and Undecided 20%. Panelbase, meanwhile, put Leave on 45%, Remain 42% and Undecided on 12%. Leave is ahead in both but clearly how those Undecideds fall will make all the difference (we’ll come back to this point). But there are some caveats. Remember that both of these are online polls and as we saw in the last bulletin the picture in telephone polls is different – in telephone polls Remain tends to have a stronger lead and it may well be that once a couple of these emerge then Remain will reassert itself in the overall race. It is also worth repeating a point made by John Curtice, namely that whereas the latest Survation poll does suggest a 2-point swing toward Leave compared to the picture in December, if you take a further step back then the numbers are actually where they were back in November. So, a big shift? Not really. But let’s wait and see where we are when those telephone polls come in…. There were some very interesting questions in the Survation poll, not least about the possible impact of an intervention from Boris Johnson or Theresa May. The possible entrance of these frontline politicians could be an important dynamic. We know from research on referendums and voting that voters often lack detailed knowledge of complex issues (like the EU). So they turn to their leaders as a ‘shortcut’ when making their decision. Having leaders who can reach out beyond your core vote is, therefore, critical. Before Boris gets thrown out with the bathwater, however, it is worth considering some other polling evidence. 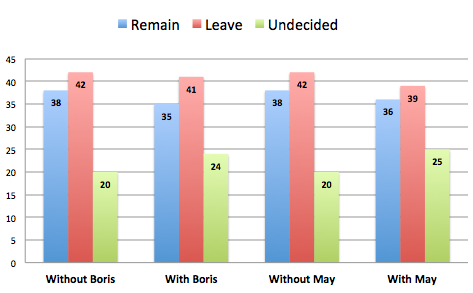 Back in October YouGov also explored the Boris effect. They first asked the standard referendum question -making no mention of Boris or Cameron. Remain was on 42% and Leave 39% – a three point gap. But when voters were presented with the idea of Boris campaigning alongside Cameron for Remain things changed radically. Remain held a decisive victory – 49% to Leave’s 31% – an eighteen point gap. In other words, the image of two of Britain’s most powerful political communicators standing side by side boosted Remain’s majority by a rather staggering fifteen points. Now, we already know that Cameron is a major asset for the Remain camp whose reach extends further than others (e.g. check this out). So, put Boris with Dave and you likely have a dynamite combo. But what if Boris argued for Leave, against Cameron? The picture changes again. Remain is still ahead but its lead is reduced to from eighteen to six points, 42% to Leave’s 36%. This does suggest that Boris may have an effect, neutralising the Cameron effect and helping to shore up support for Leave. But, on his own, he nonetheless remains on the losing side. We are not left with much evidence that, for Leavers, Boris would be the game-changer that many claim he is … (although mother still loves him). How this might change were Boris to join a broader alliance of Outers who together have widespread public resonance, including Nigel Farage and Theresa May, remains unclear. Now, unless something dramatic happens at the summit next month then it is likely in my view that this is an accurate description of what Cameron will in fact end up presenting to voters. But what impact would this have? Well, it’s interesting. Voters were presented with the outcome and asked whether it was good, bad or neither. As the chart below shows, and perhaps worryingly for Leavers, at no time do a majority view the renegotiation in a negative light. Overall, 46% felt that it would be a good outcome and only 19% felt it would be bad. But now look at the Undecideds. They break more strongly than anyone in viewing Cameron’s likely ‘deal’ as a good outcome – 57% taking this view but only 6% view this as a bad outcome. This should be seen alongside the Lord Ashcroft research that we discussed last time, and which showed how the Undecideds look more averse to risk than the average voter. 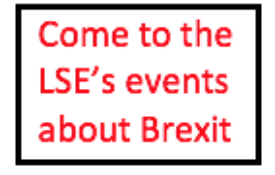 So, throw in the effect of Cameron priming them about the risks of Brexit and this is, in my view, further evidence for why the Undecideds are likely, in the end, to line-up more heavily behind Remain – unless, of course, something changes in the renegotiation or an event heightens a perception that Remain is a bigger risk than Brexit. 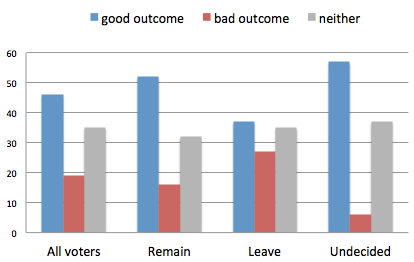 This is another reason why Leave requires a clear lead – to be able to neutralise these likely losses. Since Christmas there has also been more of a debate about the referendum’s impact on Scotland and what feels like a fragile United Kingdom – notably after William Hague suggested that Brexit could lead to the break-up of the UK. However, while it is true that Scotland now consistently breaks in favour of Remain, the assertion that a vote for Brexit elsewhere would inevitably lead to Scottish independence is not supported by as much evidence as some claim. In a recent review of the polls John Curtice explains why the picture is more complex. While recent online polls provide some limited evidence that Brexit could possibly tilt support for independence in Scotland into a majority position (52%), this remains below what the SNP itself has said it would need to stage a second referendum (while the evidence itself remains rather patchy – more needed!) Charlie Jeffery also has an interesting blog on this question. 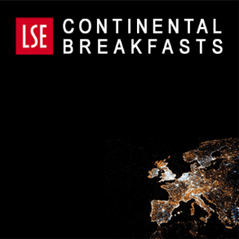 Alan Renwick asks: what happens if we vote for Brexit?